Letter From A Birmingham Jail research papers outline the very skillful and expressive letter from Dr. Martin Luther King Jr.
Letter from A Birmingham term paper due and don’t know how to start it? How about like this? Martin Luther King’s Letter From A Birmingham Jail, written in 1963, is a masterpiece of persuasive writing. 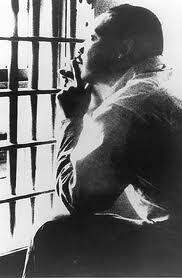 On April 16, 1963, Martin Luther King, Jr. was in jail in Birmingham, Alabama. He was jailed because of leading and participating in non-violent protests of racial segregation in Birmingham. In response to King's actions, eight fellow religious leaders in Alabama published statements criticizing King's actions and the non-violent protests. While in jail, King systematically responded to their critiques in a letter that embodied the frustrations of the segregated minority in the South. This letter would later become one of the most representative pieces of literature of the Civil Rights Movement. The strength of Martin Luther King, Jr.'s arguments in response to the criticism of his fellow clergymen is one of the reasons why King's letter from Birmingham jail was a focal-point of the Civil Rights Movement. One issue that the clergy criticized the non-violent protesters about was the untimeliness of the protests. To this, King responds with several rationale for the timing of the protests. First, he notes that although there is new city government in place in Birmingham, the new elected officials share the same support for segregation as the previous administration. Thus, he believes that waiting until the new administration had been in office longer would be in vain. Second, King then responds to the continued message to "wait" for an appropriate time to protest. He states that "'Wait' has almost always meant 'Never'," and that "'justice too long delayed is justice denied.'" King goes on to cite that negroes in the United State have waited "more than 340 years for our constitutional and God-given rights." He lists numerous offenses against the Black people during those years, and asks for the clergy to understand their impatience in waiting any longer. Another issue raised by the clergy that King addresses in his letter to them from the Birmingham jail is their concern that King is leading people to break the law and break the peace. King agrees that the protesters breaking the law is a legitimate concern. He describes, however, the difference between just laws and unjust laws. Just laws King defines as "a man-made code that squares with the moral law or the law of God." Unjust laws are defined as laws that are incongruent with moral law. King proceeds to describe how these definitions apply to the non-violent protesters. King argues that people should follow just laws, in this specific case, laws that treat all men and women equally. He believes that unjust laws, or laws that discriminate among groups, should not be followed. King further states that those who break these unjust laws should do so with the intention of suffering the consequences of those laws. He argues that those who would break unjust laws and be willing to accept the punishment for doing so are people who most truly love and respect law. King then makes examples of people who perpetrated evil by following the law, like Hitler, and people who broke the law in the name of good, such as the Hungarian freedom fighters. Another point that King argues against in his letter from the Birmingham jail is the clergy's assertion that the non-violent protests should be condemned because they precipitate violence. King argues this point by stating that the clergy are blaming the victims. He compares the blaming the protesters for precipitating violence to comparing someone for being robbed because he was carrying money. King states that oppressed people will always come to a point when they will want equal rights and freedoms. He is supporting that these be fought for in a non-violent way. He claims that if non-violent actions aren't able to facilitate movement towards equality, then in fact, the oppressed will become willing to resort to violence to obtain their freedom. Martin Luther King, Jr.'s style in writing the letter from Birmingham jail contributed to its success in becoming a focal point of the Civil Rights Movement. Throughout his letter, King makes comparisons among the actions of past religious leaders and events and the actions of the non-violent protesters in Birmingham, Alabama. For example, King compares the protesters willingness to break unjust laws in Birmingham to the early Christians willingness to face hungry lions or the chopping block rather than follow unjust Roman laws. King justifies his involvement in the protests in Birmingham by comparing himself to Apostle Paul carrying his religious teachings to the Greco-Roman world. King quotes both St. Augustine and St. Thomas Aquinas in his explanation of just and unjust laws. King also applies the label "extremist" that the clergy ascribed to him to several other religious leaders, including Jesus, Paul, Amos, and Martin Luther. Thus, King is able through repeated religious references and imagery to not only speak to the clergy to whom the letter is addressed in terms that they can understand, but also to establish the non-violent protests and King's support of them as the actions of just men and women. In this essay I am going to try to analyze it in terms of its rhetorical qualities, its use of logos, ethos, and pathos. I would like to begin by remarking that, while the Letter From A Birmingham Jail makes use of the three modes of persuasion, it is logos that dominates and that it is logos that gives this particular piece of writing its power. Dr. King had much to work with in his use of logos for the injustices against which we he spoke were public and obvious. His use of ethos and pathos was skillful and convincing, but it was the underlying truth of his case that made his arguments so compelling. Let us begin with ethos. Dr. King establishes his credibility in a number of ways, and this is something that, given the circumstances, he very much needs to do. He needs to establish who he is and what he represents, and why he is in Birmingham jail. He uses both direct and indirect means to make his case with respect to these items in Letter From A Birmingham Jail. He needs to appear creditable and needs to refute the contention that he is an “outside agitator” and he does this in the second paragraph where he presents his credentials as president of the Southern Christian Leadership Conference, “an organization operating in every Southern state.” He says that he has come to Birmingham because one of the affiliates of his organization has asked him to come for the purpose of—if necessary—engaging in a “nonviolent direct action program.” This is very skillfully done. Letter From A Birmingham Jail establishes that his organization is both southern and large and it finesses that fact that he is in jail by emphasizing the fact that his organization believes in action without violence. Dr. Martin Luther King Jr. - Dr. Martin Luther King Jr. research papers overview his life and examine his beliefs in essays such as Letter from a Birmingham Jail. Religious Discrimination - Religious discrimination is treating a person unequally due to their faith. Religious discrimination is a form of religious persecution, and exists in various levels. Augustine - Augustine research papers overview the importance of Saint Augustine to the Catholic Church and to the Christian religion. Linguistic Intelligence - Linguistic Intelligence research papers examine one of the types of intelligences identified under Gardner’s Multiple Intelligence Theory. Desegregation of Schools - Desegregation of Schools research papers discuss the overturning of Plessy v. Ferguson, in 1954, in the Brown v. Board of Education decision, which made the desegregation of American schools a major priority towards achieving equality. Paper Masters writes custom research papers on Letter From A Birmingham Jail and outline the very skillful and expressive letter from Dr. Martin Luther King Jr.